According to figures and estimates of the main players in the Romanian e-commerce, together with GPeC (all sources are mentioned at the end of the report), the value of online shopping reached 2.8 billion euros in 2017, at least 40% more than in 2016 (when the total gross was of 1.8 to 2 billion euros). It means that Romanians spent an average of 7.67 million euros every day in 2017, for online shopping. The 2.8 billion euros refer strictly to e-tail, to physical (tangible) products that were ordered online and it doesn’t include services, utility bills, air tickets, holidays, hotel bookings, show tickets, downloadable content etc. If we added those, the total amount of online purchases would increase considerably. The increase of approx. 40% year over year, recorded by the Romanian e-commerce market, is one of the highest in the European Union. The value of the e-commerce market in the total retail market is around 5.6%, up from 4% in 2016. However, the percentage is still small compared to the developed countries, but it shows the huge potential for growth of the Romanian e-commerce market. “2017 was a spectacular year for the Romanian online trade, registering a significant increase of approx. 40% compared to 2016 and thus reaching the threshold of 2.8 billion euros only in e-tail, without services. It is a huge leap that shows us the increasing appetite of Romanians for online shopping and especially the potential for accelerated growth of local e-commerce”, said Andrei Radu, Founder & CEO at GPeC. 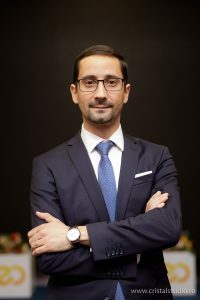 “Even if Romania has not reached yet the level of other mature markets in Europe, we must not neglect the rhythm and the growth potential that can lead us to a market of over 5 billion euros by 2020,” he added. 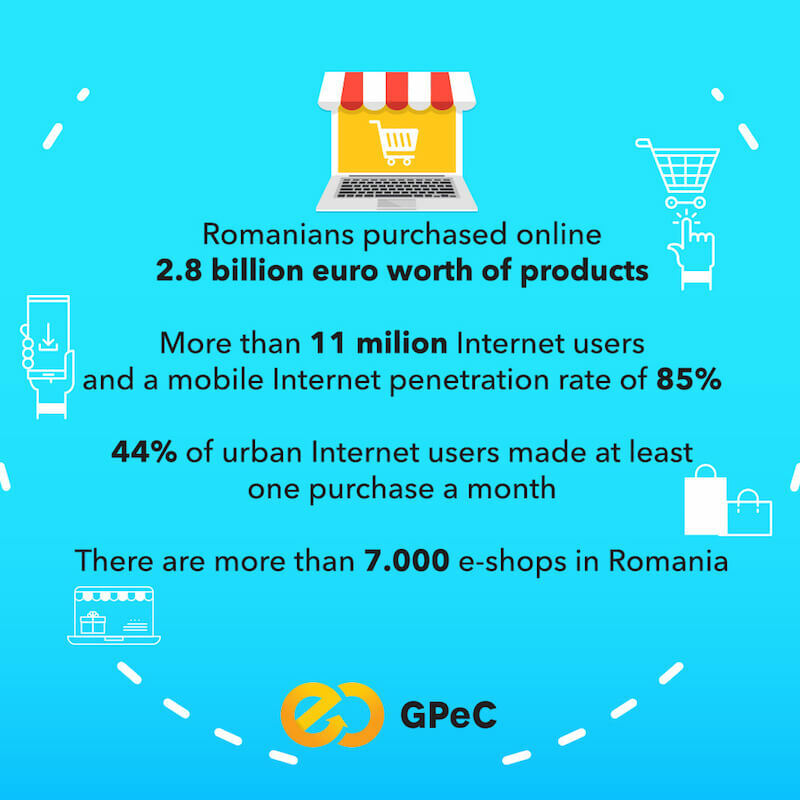 For 13 years, GPeC is the most important e-commerce event in Romania, which, among other things, centralizes data and publishes every year the official report of the Romanian e-commerce market. Here are the main figures and statistics for the last year. According to the United Nations Department of Economic and Social Affairs, the population of Romania has declined from 19.4 million inhabitants in 2016 to 19.1 million in 2017. More than 11 million of them are Internet users, according to the latest report of the National Institute of Statistics, for the first semester of 2017. Internet penetration rate increased slightly compared to 2016, with ANCOM statistics showing that there are 4.6 million fixed broadband internet connections (+ 6% compared to 2016) and 16.6 million broadband mobile internet connections (+ 13% compared to 2016). Thus, the penetration rate of the fixed Internet per 100 households is approx. 55%, and mobile internet penetration per 100 inhabitants is 85%. In April 2017, GPeC and the market research company iSense Solutions conducted a survey among Internet users, on a sample of 1,012 respondents – a representative sample at the urban level by age, gender, size of the locality and region. According to the study, 44% of urban internet users shopped online at least once a month, and 62% of them are 18-34. Online buyers visited 9 stores last year, on average with a frequency of 3-4 times a week, while non-buyers visited 5 online stores within 12 months, with a lower frequency (1 per week). In other words, online stores are visited quite often even by those who have not purchased something yet. The main reasons of those who did not buy online are, in order: mistrust in the products displayed on the website; lack of possibility to see and test the products before the purchase; mistrust in the quality of online shops and the obligation for payment of additional shipping charges. On the other hand, online shoppers prefer shopping online because: they save time; the supply of products is richer; they can easily compare products; it is cheaper and more convenient online. The number of online stores increased significantly from approx. 5,000 stores in 2016 to over 7,000 online stores in 2017. According to eMAG officials, the trend of growth will continue in 2018 and the number of online merchants will double to around 14,000 – 15,000. According to the latest research, there are already about 25,000 .ro e-shops that have an “add to cart” tool, so they can be considered as online stores – but their low traffic makes them insignificant in Romania. Thus, only 7,000 stores are sufficiently relevant in terms of traffic and orders. The top categories of products sold online in 2017 (excluding e-tail) are, in decreasing volume order: Electro-IT & C products (e.g. PC and PC components, notebooks, tablets, mobile phones, electronics and home appliances etc. ); Fashion & Beauty products (clothing, footwear, accessories, cosmetics, perfumes, watches, etc. ); home deco products, books and children’s products (from toys to children’s items such as trolleys, clothing, consumables etc.). The ranking is similar to the year 2016, but according to estimates of the main players, the Fashion vertical is growing faster and will surpass the Electro-IT&C products in approx. 5 years, becoming the main category of products traded online in terms of generated volume. Also, the Home&Deco product line has a tremendous growth potential. An important conclusion of 2017 is the increased value of online purchases, explained by increases of wages in the country and, therefore, consumers purchasing better quality products. Also, the number of products purchased during one visit on the website increased and, implicitly, the average value of transactions increased. As for the Electro-IT&C segment, the average basket value increased from 669 lei in 2016 to over 800 lei in 2017, with some peak moments during the year (e.g. Black Friday) when the value was near or even exceeded 1,000 lei. Significant increases in the average basket value were also recorded in the Fashion segment, from 161 lei in 2016 to 250-300 lei in 2017, with some peak moments during the year and the type of products (brand products – where values ​​are higher vs. non-brand producs – where values are lower). In the Home & Deco category, the average transaction value is similar to the 2016, of approx. 480 lei. In the case of online bookstores, the average value of the basket varies between 80 and 100 lei, slightly increasing compared to 2016. Only in the case of children’s articles, the average transaction value is on a descending trend for more than 3 years and continued to decline slightly in 2017, from 203 lei to 195-200 lei. “Mobile” continued to be the main trend of 2017, and the trend will continue in 2018. The main online Romanian stores have seen significant increases in traffic generated by mobile devices: approx. 70% of site visits are from mobiles, 20% higher than in 2016. The Millennials generation is the one that pushes the percentage higher, most of the young people getting acquainted with the internet directly on their mobile phone and rarely on desktop devices. For online stores that have dedicated mobile apps, the conversion rate generated by mobile devices has already exceeded the desktop. But in the case of online mobile shops, where visits are initiated in the browser, the mobile conversion rate is still half the desktop. More and more Romanian online stores have grasped the trend and optimized their websites for mobile devices, but poor optimization of the mobile theme that generates higher loading times remains the main challenge of most domestic online stores. According to the GPeC and iSense Solutions study, the main factors in making the buying decision are, in order: the lowest price; brand reputation; delivery time as short as possible; the clarity and quality of the information on the site; site usability (ease of navigation and purchase and site aesthetics); loyalty policy of the online store. An online buyer made an average of 8.7 purchases over the past year – up from 2016, when the average was 8.4 acquisitions, but also from 2015, when the figure was 8.2 acquisitions per year. The preferred method of payment for Romanians remains the pay on delivery (approx. 85%). However, according to the information provided by mobilPay and PayU processors, the percentage of online card payments has increased significantly, from approx. 8% in 2016 to 12-14% in 2017. The difference of 1-2 percent up to 100% is given by other payment methods such as online banking, micro-payments via SMS etc. According to estimates, the total amount of online card payments exceeded 1.2 billion euros in 2017, up from 2016, when it was 745 million euros (source: RomCard). According to the ARMO (Romanian Online Store Association), during the Black Friday weekend (November 17-19, 2017), Romanians bought products worth over 200 million euros, 35% more than the 130 million euros recorded in 2016. Black Friday increases are significant year over year: 75 million euros for Black Friday 2014, 100 million euros for Black Friday 2015, 130 million euros for Black Friday 2016, more than 200 million euros for Black Friday 2017. More and more online stores choose to have Black Friday campaigns (often run under different names) throughout the year. According to them, regardless of the name under which the discount campaigns are conducted, the sales increase by approx. 25-30%. The sources of figures and market estimates published in this report are: ANCOM, ARMO, Breeze Mobile, eMAG, GPeC, National Statistics Institute, iSense Solutions, mobilPay, PayU, RomCard, United Nations Department of Economic and Social Affairs. This report can be quoted with the source GPeC (and a link back to www.gpec.ro). 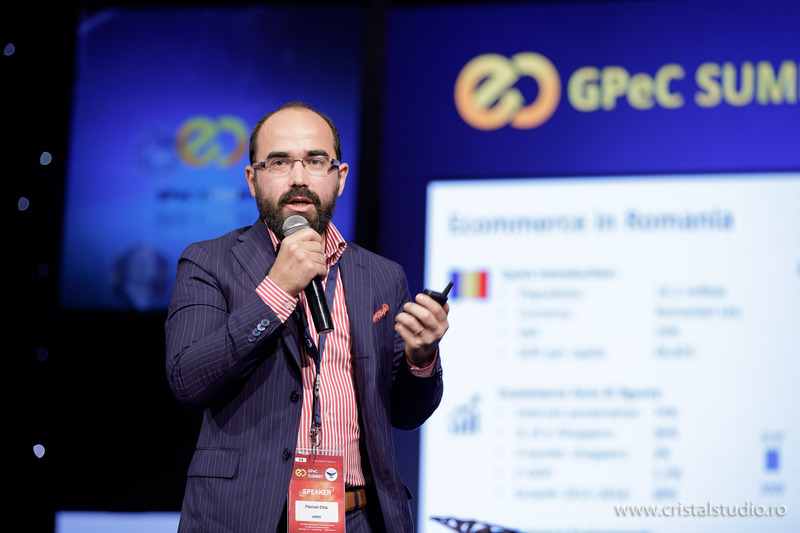 GPeC is the most important E-Commerce event and is the largest community of online stores in Romania. 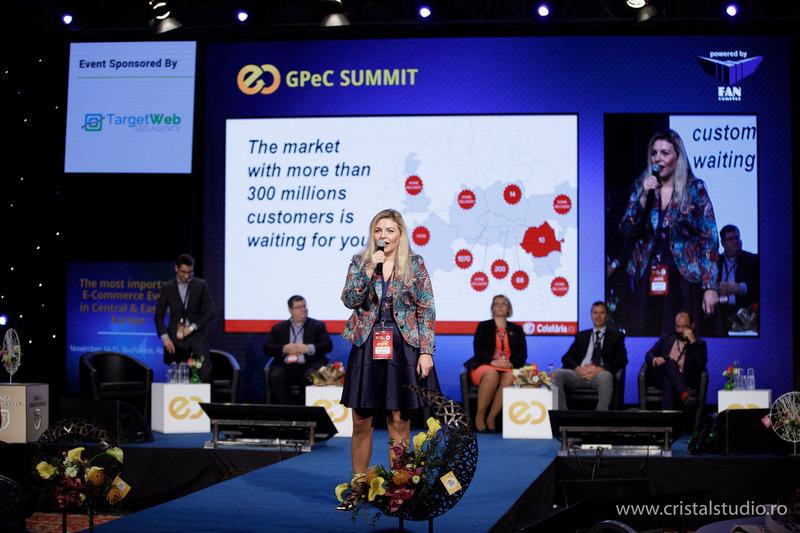 With a 13-year tradition, GPeC is the perfect mix of Conferences, Workshops, Exhibition, Intensive Courses, Statistics, Community and, in particular, the Online Stores Competition, with the precise role of contributing to the development of the e-commerce market. 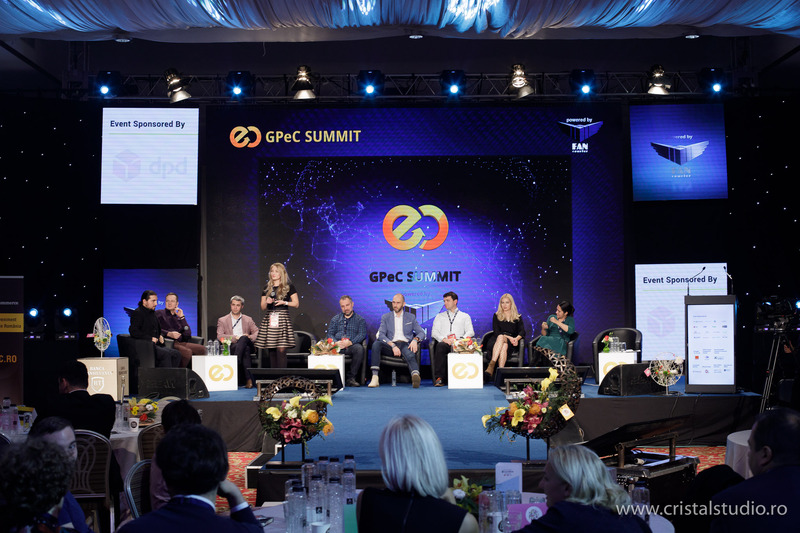 Entries to GPeC 2017 Online Stores Competition start March 2018, and GPeC SUMMIT Spring Edition (3 Days of Conference, Workshops, Exhibition) will be held in April 2018. All details will be published soon at www.gpec.ro.